Today I was having a conversation with a couple of state workers and things started to drift to politics. So I needed an escape hatch, not that I mind talking politics, but opinions always get heated, so I asked them where do the locals go to eat food in Honokaa? We all agreed that Tex Drive Inn with their ‘ono kine’ malasadas has gone quite touristy. They suggested I go to a place just below Honokaa High School so off I drove to C.C. 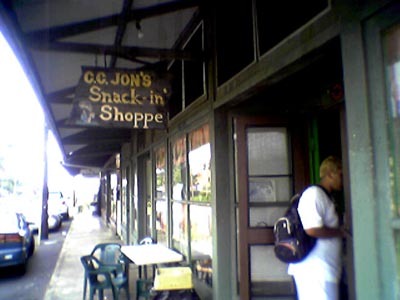 Jon’s Snack-in Shoppe. School got out early on Wed and I got to the snack shop about 10min after the last bell rang. It was my late lunch and wasn’t sure if I should really try the tiny shop but decided to check it out. When I walked in the doorway I was transported back in time to another universe. 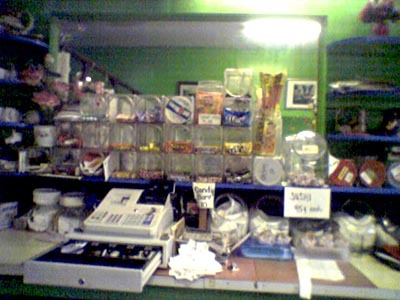 An age of innocence, where jars of candy against the wall awaited the pointing fingers of kids to be chosen like puppies in a pet store. And candy is asked for not by name but by the color of its package. Kids jammed the counter near the shave ice machine where an elderly Asian man carefully packed the snow onto cups and re-quizzed kids as to what flavor they wanted. The man is deliberate and careful building the shave ice and the kids are all very patient and polite waiting their turns. Everyone in there, except me, ordered like they’ve done it a million times before. I heard someone order a large vanilla Coke. Now I know Coke now makes vanilla flavor, along with lime, lemon and cherry, but this place had a dispenser, not bottled soda. Then I noticed that they were adding flavored syrups to the soda for an extra charge. Vanilla, coconut and other flavors. At a round table in the tiny snack shop high school boys relax and lean back in their chairs talking-story to each other. 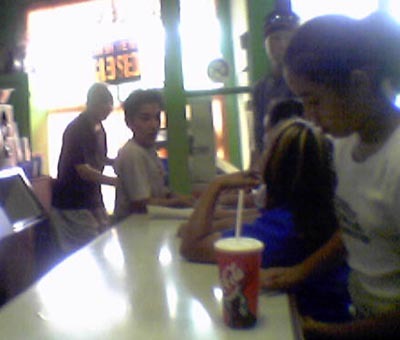 Younger kids had more purpose ordering drinks, food, candy and shave ice. This was their universe and I was just lucky enough to be sitting there like a bug on the wall taking it all in. It was like watching some Discovery Channel special about local soda-fountain shops. I am also lucky enough, I figure, that I look local and blended-in and didn’t disrupt life in the shop. I probably need to get back here to make some photos. Sitting there at the old style soda-fountain counter on glittery, shiny red round vinyl seats really takes me back in time. Back to when things were simple, folks got along and life was good. Everyone should have such a place to go to often or at least visit.